The Red Bull Romaniacs Offroad Day 1 main challenge was going to be the muddy and slippery track conditions following a night of heavy rainfall. This is not a first for the Red Bull Romaniacs, vivid memories of 2010 were brought back when the Offroad Day 1 conditions were similar. The starting order this morning was defined by the prologue yesterday: Taddy Blazusiak would go first, followed by Wade Young, Billy Bolt, Manuel Lettenbichler (Mini Letti) and Jonny Walker. The classes took off in the following order at 6:30am in the morning: Gold class together with the Bronze class, Silver 30 mins later and Iron at 8:45am. 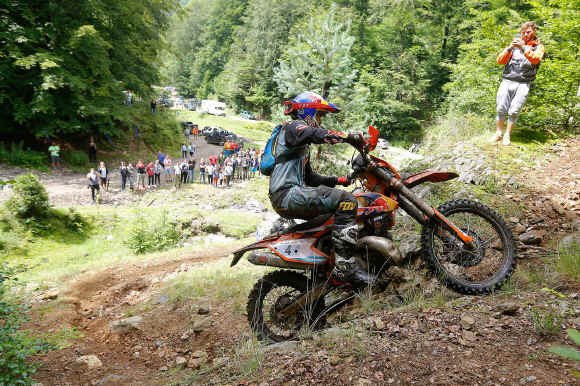 The race-track included some of the feared Red Bull Romaniacs signature sections such as "Better stay dry", "Switchback heaven” and "Switchback hell” as well as two liaisons (33 km before the Service Point and 10 km after). 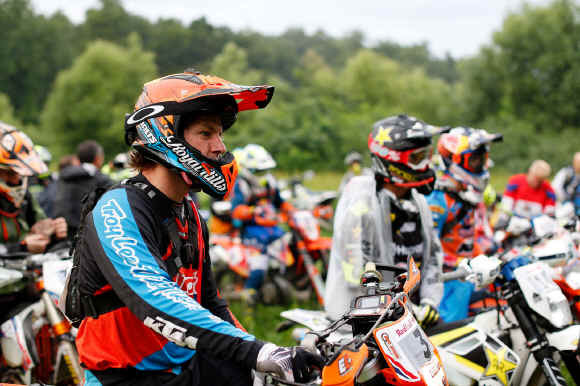 Competitors, all too aware that weather is a key factor in enduro, set out into the wilderness in wet and foggy conditions, heading into an old, dark forest right after the start. Motivation was high and the best times after the start (reported from “The frog valley”) came in from Wade Young, Jonny Walker and Travis Teasdale. Later in the morning, Jonny Walker started pulling some of the best times, followed by Travis, Mario Roman and David Cyprian. After the Service Point and all the way to the finish, the “Young Guns” Mini Letti and Wade Young dominated the day and battled it out like Jarvis and Walker the years before. Both (Mini and Wade) are known for loving the fast sections and for “pinning it”. They were rewarded with a first place (Mini) and a second (Young). Jonny Walker was hot on their heels throughout the day, not letting them out of his reach. 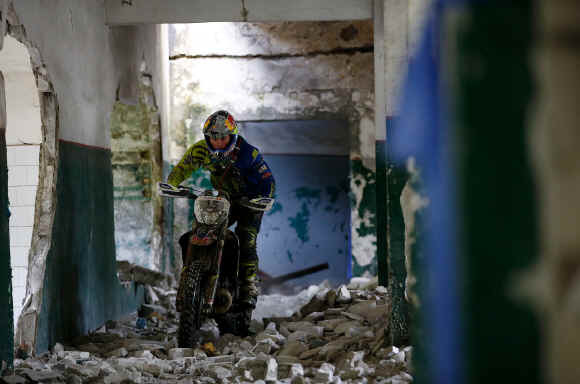 Even though Jonny considered himself having made too many mistakes during the day, he finished as a strong 3rd and appears to be quite charged for the next three days of the usual Red Bull Romaniacs “Enduro mayhem”. The “King” Graham Jarvis, started from 7th position and was seen slightly caught aback by the cold weather during the first liaison, just before the 600cc section. Once he had ploughed through 600cc, feeling cold was not a problem anymore… He started increasing the rhythm in the 2nd half of the day, building the foundation for his strategy to win the race. Jarvis finished forth but reported some fatigue issues. Taddy was 5th, Paul Bolton 6th and Billt Bolt 7th. Nathan Watson retired at CP5. The top riders didn’t seem to be fazed by the slippery ups and downs, they rode the sections such as “600cc”, “Better stay dry” and “Forgotten trail” without any problems. The same could not be said for the Silver Class who were finding it difficult to negotiate their bikes in a straight line without them sliding out sideways down the steep hills. Dieter Rudolf led from Josu Artola and Emanuel Gyenes. Stefan Simpson moved up into 5th and Dave Wood 8th. Sam Ludgate was 15th despite aggravating an arm injury. Josef Westgarth was 18th, Mark Jackson 23rd, Grant Churchward 28th. Wil Westgarth 35th and James Jackson 42nd. The Bronze class riders were in for a bit of a “massacre” due to the weather conditions and had their proper Red Bull Romaniacs treatment all day long. They still managed to bravely make it through the day despite being caked in mud from head to toe. The numerous fans on site were offering much appreciated helping hands. Gianino Coscarelli consolidated his lead ahead of Milos Novakovic and Bieri Marc. Gethin Francombe made great progress in the wet conditions rising from 125th after the Prologue to 19th. The organizers themselves are also faced with some real challenges - having to relocate to the overnight bivouac location late after yesterday's prologue. The whole headquarters and support team moved ahead of the race circus to the scenic ski resort of “Straja” in the Valcan mountains. Most of the team only arrived around 3am in the morning, expecting to get an average of only 2 hours sleep.